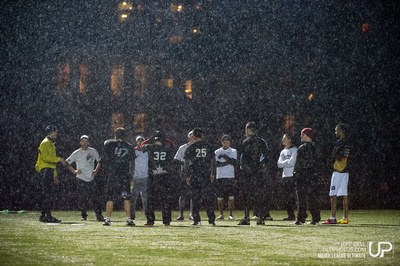 The Nighthawks (Facebook/website) — the Vancouver franchise of the new MLU syndicate — concluded its player evaluation process March 14, under torrents of quintessentially west coast rain. Managed by local ultimate magnate Brian Gisel, and staffed by former Furious greats Andrew Lugsdin, Jeff Cruickshank, and Greg Shiring, the franchise was destined and designed to carry the Monkey’s trust, and our players turned out under the lights in force to try out. Eighteen members of the 2012 roster joined with eight other hometown heavyweights (from the young Keane Knapp to the renowned Kirk Savage) to form the Hawks. While Furious George extends its official offseason to June, they will spend their spring learning to play the game under MLU rules and formats. The differences are many, and will take some getting used to. From the new Innova Pulsar discs to the 53yd-wide (endlessly wide!) fields, to the freshly-trained referees, there is a lot to take in, and a lot of room for new thinking. Overlapping this spring schedule, five of our finest (Berezan, Collins, Hibbert, Loach, and Menzies) continue to train for the World Games squad, whilst Collins (coach), Davis (coach), Underhill and a host of candidates also share their time with the U23 national team as they prepare to defend their title in Toronto. In July, Furious George will regroup and begin the Triple Crown Tour in Atlanta, in the Elite Flight, just before the World Games and the U23 Championships. In August, the Angry Monkey plans to attend the Canadian Ultimate Championships on home turf. Come September, we will being the road once more to the USA Ultimate Club Championships.